Typically I run away from any eye makeup that is labeled “bulletproof”, “waterproof”, “makeup remover proof”, “watch this product rip your eye holes off and cause wrinkles because you are frantically rubbing to get this sh*t off- not dummy proof”. EYE RUN! I am a working makeup artist in New York. I work with all sorts of makeup daily. If I am working on a client who has watery eyes, oily eyelids or they like to swim with a full face of makeup on, I ALWAYS reach for ultra waterproof makeup. I also point them in the direction of an oil based makeup remover/cleanser to remove said makeup. 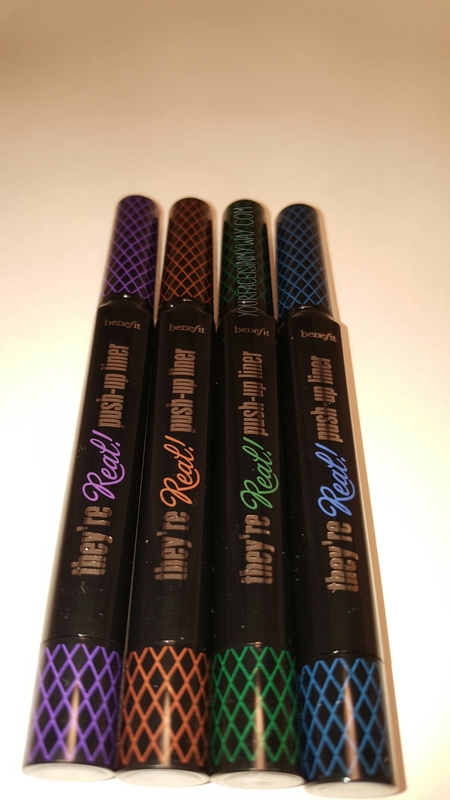 Benefit They’re Real Mascara and Pushup Liner are seriously everything proof. Don’t beleive me? Try anything from that product line, then go surfing or sit in a sauna. Your eye makeup will still be fully intact. 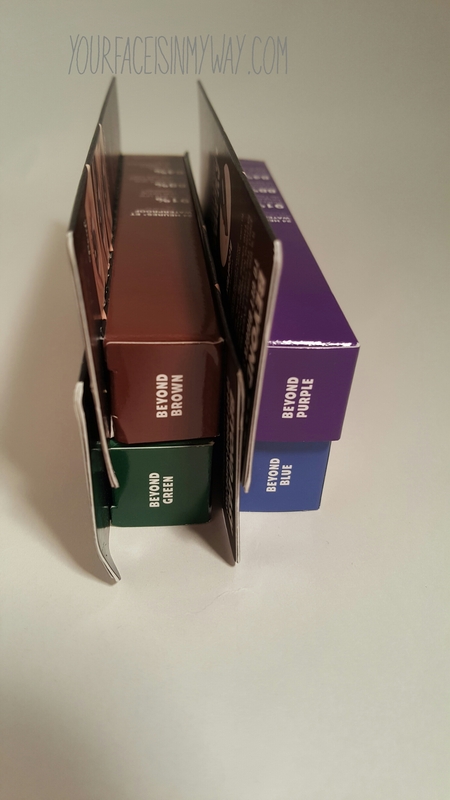 June 26th I was given 4 of the new Pushup Liner colors that were launched. I am an honest person so I will say, I was kind of scared to put them on as I know how serious the stay power is for this line. Remember when I mentioned it was everything proof? 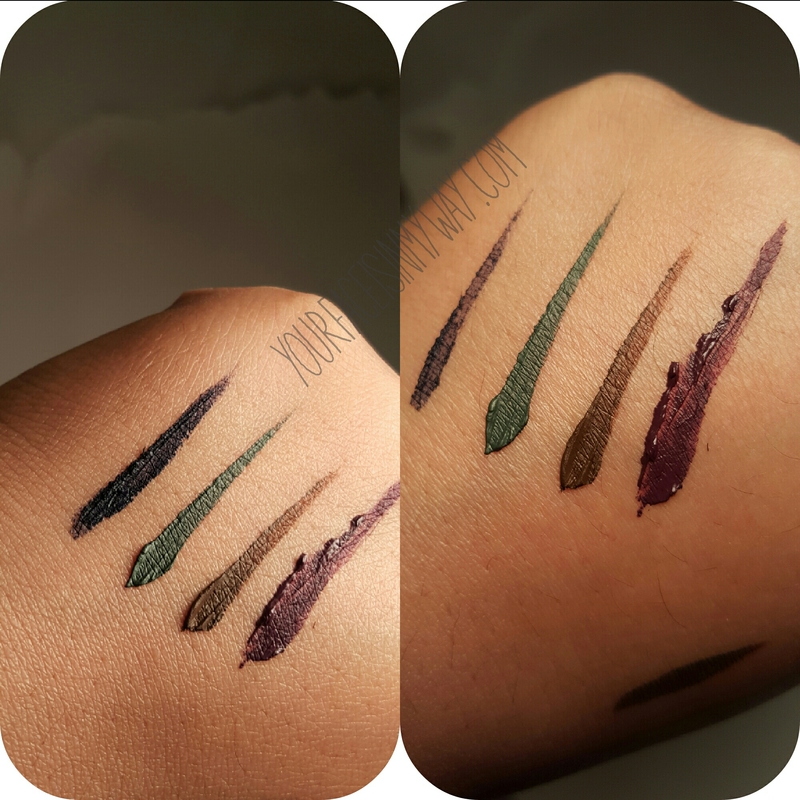 When I swatched them on my hand they seemed to dry insanely fast and were pretty difficult to remove with my Boots Hibiscus makeup remover. HOWEVER, when I used the liners on my eyes and then tried to remove it with the makeup remover, it came off in 3 smooth swipey- rubs. No mess. No pain. I was impressed. Should I talk about the formula and texture now? I kind of skipped that early on…duhh, I know you all noticed. I had a hard time getting a super sharp line on my first go with these liners. 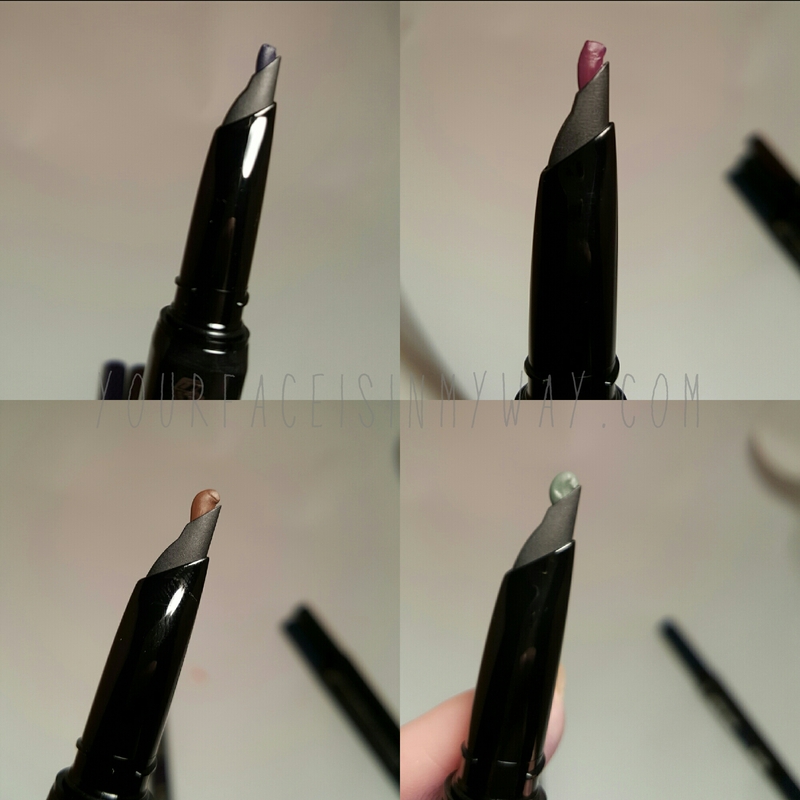 I am so used to using a felt tip marker liner or a brush and potted gel/cream liner. I suppose this thick wing look is better for blogging purposes? Don’t you judge me! After an hour the blue liner started to flake and because they were on together, it took some of the purple with it. It hurt my eye holes. Perhaps putting the purple on alone and with an actual brush would make a difference in the way the color looks and stays. The brown and green remained smooth and solid. For the record, I really love the purple and blue colors. There were just too many inconsistencies. The texture of the blue was disappointing. I am baffled as to why. Maybe the pigments cause the formula to change? I’m not a chemist..soooo…yeah. If you are dying to try these, I would definitely suggest the green and brown. The purple is beautiful, but inconsistent. Skip the blue until they hopefully reformulate it. 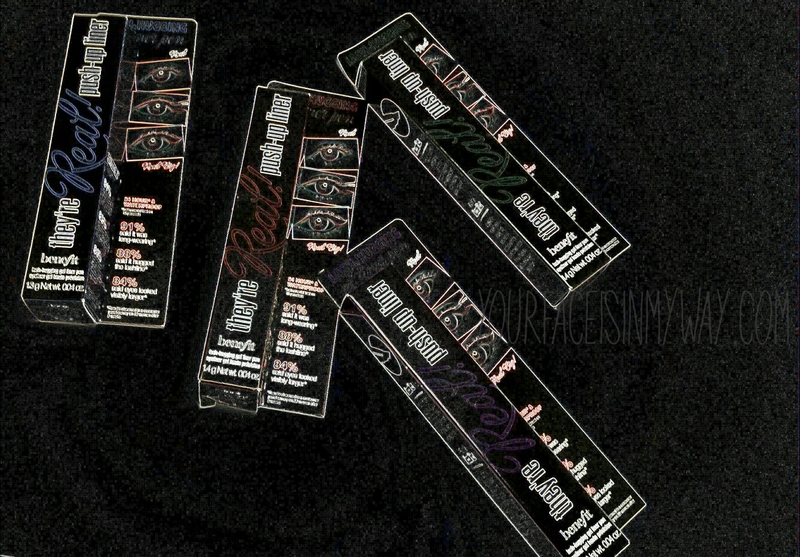 You can purchse these at Ulta, Sephora, Macy’s Impulse Counters or Benefit free standing boutiques. I’ve been seeing these everywhere… I can’t see myself buying this product but I loved reading your review! Beautiful!! I need these and the blue mascara too! !